Though you’d never know it from the way most teens turn their noses up at anything related to nature, kids love birds. Young children in particular love birds, though in an undifferentiated way that bears little resemblance to the obsession evinced by more mature birders. My budding naturalists Mason and Ivy love, to my alternating delight and dismay, to paw through whatever field guide or reference book I’m studying at the time. But for the most part, Sibley and the like are as good as it gets for them due to an apparent dearth of age-appropriate bird books. Award-winning nature photographer Steve Hutchcraft noticed the same problem but actually did something laudable to address it: he wrote his own children’s bird book! The result is a delightful work titled B is for Bufflehead, inspired by the spirit duck with the buffalo head. 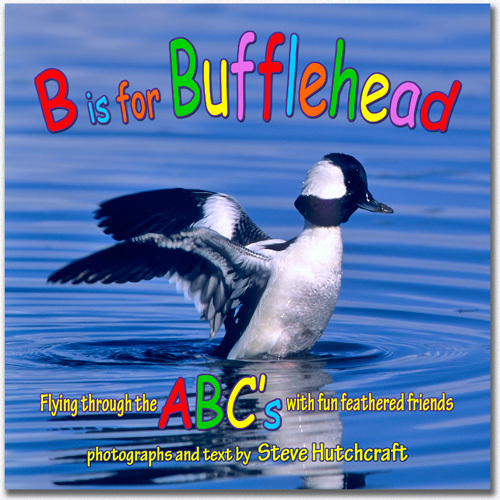 B is for Bufflehead is a fun read that takes, in the author’s words, “a flight through the ABC’s with a flock of fun feathered friends.” The letter A is for Auket, as in Rhinoceros Auklet, and Avocet while Z stands, of course, for Zone-tailed Hawk. Each letter in between is represented by one or more birds portrayed quite skillfully in the author’s own photographs and annotated in his words. Mason and Ivy loved it! Mason in particular, as a five-and-a-half year old who wants to share his father’s interests, took to B is for Bufflehead. He really enjoyed the style of the entries along with the amazing photos. Better yet, he paid attention. Days after we received the copy Steve Hutchcraft so graciously sent, Mason pointed out loons in some nature show on TV as “just like L is for Loon in B is for Bufflehead!” I’m pretty sure Mase might have been buttering up his old man, as he knows loons from previous experience but I’m proud anyway. I suspect other parents interested in bird watching will feel the same way about the reactions their kids have to this book. If you’re looking for a bird book appropriate for young readers, B is for Bufflehead is the one. Sweet! Does it have regular paper or cardboard pages? Good question, Nate. This isn’t a board book so keep toddlers away! thanks so much for sharing this book…. I have a 4yo nephew who has shown interest in birds, and I think this book will be great for him!